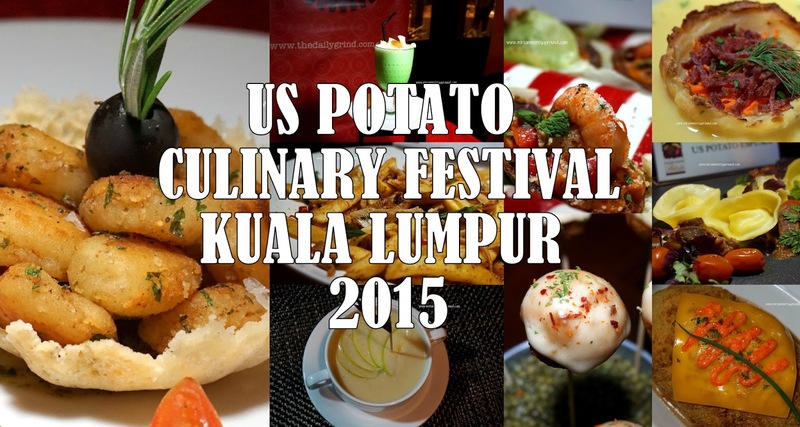 The US Potato Culinary Festival Kuala Lumpur is back and with more awesome potato-y creations from 14 Chefs! I remember last year when my Facebook was flooded with delicious looking potato goodness and this year I was able to attend and savor these amazing creations! Most of the time when we think of potatoes the most common dish that pops up in our heads would be French Fries or Mashed Potatoes but I must say I was wowed by the creativity of the dishes cooked up by the chefs! Can you imagine potatoes in your drinks and desserts?? Nope, leave behind boring preparations of potatoes and feast your eyes on potatoes in everything from starters to mains and even to desserts and drinks! Do you know that the humble potato when cooked discerningly is in fact one of the healthiest vegetables one can consume? Do not just think of potatoes to be full of carbohydrates, starch and high in calories but in fact, One medium-size (5.3 ounce) skin-on US potato contains just 110 calories per serving, boasts more potassium (620g) than a banana, provides almost half the daily value of vitamin C (45 percent) and contains no fat, sodium or cholesterol. I must say that if my potatoes were cooked the way it was served at the US Potato Culinary Festival Kuala Lumpur 2015, I have no problem whatsoever to dig in! I had a feast of potatoes and from the photos I am sure you will be able to see the amazing creations the chefs came up with. One of my favourite potato dishes from Big Hug Burger which is their Cheesy Layered Beef in US Potato Pocket! Creamy with a savoury flavour from the beef, it was one of my favourites. If you follow my blog or Instagram, you would know I am a total sucker for aesthetic looking dishes which tempt my eyes before making me salivate. Just looking at this pretty dish prepared me for more dishes to come! Something different with potatoes would be the Japanese Curry Spaghetti with US Potatoes where the kick of curry helps balances off the spaghetti and potato combination. This definitely goes under the category of comfort food for me. Meanwhile Best Western gives us a Malaysian twist to the US Potatoes with Malaysianized potato dishes. Their Kerabu US Potato, Crispy Fried US Potato with Ginger Flower and Sweet Chili Dip is definitely a Malaysian dish. Of course I just love how they presented the US Potatoes with Seafood which is bursting with seafood flavour. The Burger Factory gave us some tasty English Curry Fries which I am so in love with! The kick of curry powder plus the crunchy anchovies and groundnuts is just the best snack on earth with the thick cut US Potato fries! Oh I can just munch on this all day long but wait.... it will be just too sinful! Among all the participating restaurants and hotels, I must say that the best looking dishes goes to Jibby & Co. Just look at their dishes! So pretty!! Their Parisian US Mashed Potatoes with Sumac Spiced Chickpeas and Basil Pesto Sauce is just so eye-catching. At La Bo Ca, you will get something out of the box with their US Potato Macaroon Bars with Chile Ancho Chocolate. Nope, you did not read that wrong. It is in fact a chocolate macaroon dessert with potatoes in it! Curious on how it taste like? Don't forget to drop by La Bo Ca to have a taste! Villa Danieli also served up some delicious creations for the US Potato Culinary Festival and I really liked their US Potato Espuma which pleasantly presented and something different from the traditional potato dishes. Would you just look at the marbling on the smoked wagyu beef?! Unfortunately I was unable to grab some of it to taste as it was swooped up so fast! It looks so tantalizing I think I might just have to drop by La Risata to have a taste! Lastly the Daily Grind sure came up with some weird and quirky creations with their Crispy US Potato Milkshake! Who says we cannot put potatoes in milkshakes?? The addition of crispy potato crisps on top gives the milkshake some additional texture to it too! And did you see that Dog's Dinner? It was really served in a dog's bowl and I do hope it is a brand new one! *joking* The Daily Grind sure made a statement that night with their dishes! So many dishes made out of potatoes and I am sure you would be dying to try them out! Remember to check out the participating outlets as they will be serving up these amazing dishes at their outlets. Share with me your favourite potato dish out of the lot! 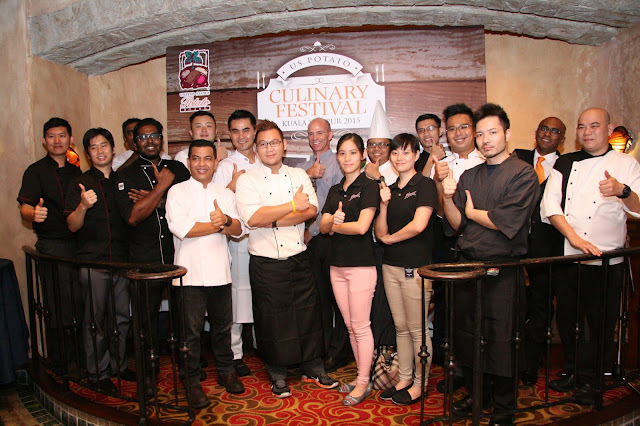 Til then kudos and bravo to the chefs involved in this culinary festival!